The major story of the playoffs, obviously, was the Cubs winning the World Series. But that’s something we only got to know after the fact, and in the thick of things, the playoffs are a random jumble of assorted other stories. There was Trevor Bauer and the drone. There was the surprise appearance of Ryan Merritt. There was Clayton Kershaw pitching in relief. And there was Pedro Baez demonstrating a reluctance to ever be pitching at all. Baez is not baseball’s only slow worker, but he probably became the new face of the group. When he was a rookie in 2014, he averaged 29 seconds between pitches, ranking him tenth-slowest. The next year, his average increased to 29.8, ranking him first-slowest. Runner-up Junichi Tazawa made himself slower by seven-tenths of a second, so Baez responded by making himself slower still, bumping that average to 30.2, again the slowest mark in the game. It’s something that’s simultaneously subtle and ever so noticeable. Baez’s nickname, according to Baseball-Reference, is The Human Rain Delay, and that’s because whenever he gets summoned from the bullpen, the umpires get together to discuss whether they should just call the thing and go home. It’s not that Baez is incapable of working fast. Here he is throwing two pitches, which are only 16 seconds apart. That’s pretty good. That’s actually quick! It’s like a Billy Hamilton home run. A Billy Hamilton home run is not an impossibility. We’ve seen them happen. We’ve just mostly seen them not happen. When Hamilton comes up to the plate, the outfielders don’t all usher each other backward. You assume he’s going to hit a weak ground ball someplace. Baez has worked fast, but he doesn’t make a habit of it. For one reason or another, his happy place involves taking his time. Or, alternatively, that’s his unhappy place, but he spends most of his professional life visiting it. The idea of this article has taken a few different forms. At first I wanted to write a general article about Baez’s pace. Then I wanted to see when he worked fast. Then I wanted to see what an average Pedro Baez between-pitch period looks like. Finally, I settled on this: looking for the most time Baez spent between pitches to the same batter in 2016. The usual data, conveniently, comes with a time stamp. So from there it was a matter of studying and sorting. I had to eliminate a few data points because of instant-replay reviews. I had to eliminate a few other data points because of injuries. I didn’t want to end up with something that only happened because of a delay that was out of Baez’s hands. That would defeat the purpose, if there is a purpose at all. 111 seconds. One-hundred-and-eleven seconds. Excluding those other points I threw out, Pedro Baez topped out last year at going almost two full minutes between pitches. Pitches, furthermore, to the same batter, in the same plate appearance. Other data points were fairly close, but there can be only one winner, and this took place on October 15, in the sixth inning of Game 1 of the NLCS. Of course it happened in the playoffs. I think we knew that without knowing it. The question then becomes: why? Why would something like this ever happen? Time for us to watch it all together. The game’s close, but the Cubs have the clear advantage. 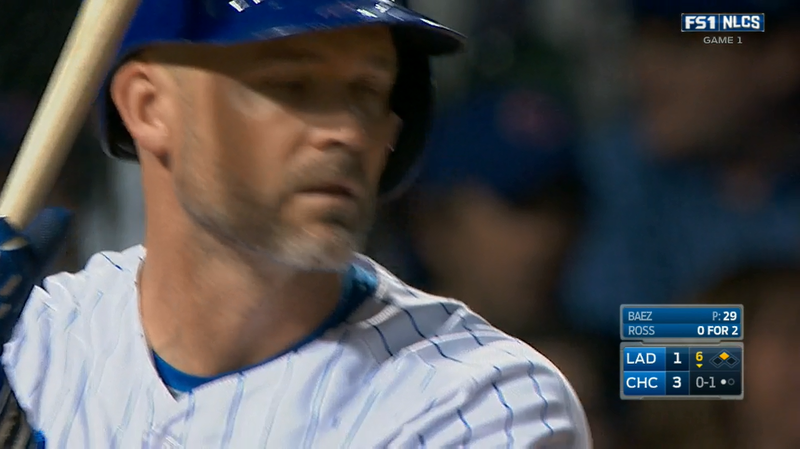 David Ross has stepped in with one down and Javier Baez occupying second base. This might get confusing, on account of the Baez duality. Rest assured, the only Baez of interest to me is the one who is holding a baseball. Now, Baez isn’t unusual, in that he works slower when the bases aren’t empty. That’s just a reality of being a pitcher. But he’s already slow, so he gets slower still. I hope I didn’t lead you to believe this exploration was going to be fun. This is going to be stupid and horrible. There are hiccups involved. There have to be, to approach two minutes of nothing. Technically, it’s Ross who’s responsible for the first delay, as he calls time and steps out. My favorite thing about this: Baez remaining on the rubber. He stands there as if to implore Ross to hurry up. Batters do that sometimes, staying in the box even when the pitcher steps off. It’s a way for them to convey that they’re ready, and they’ve never been more ready, and, say, no offense but you’re being super annoying, let’s please just get back to playing baseball. But Ross calls time after 30 seconds. 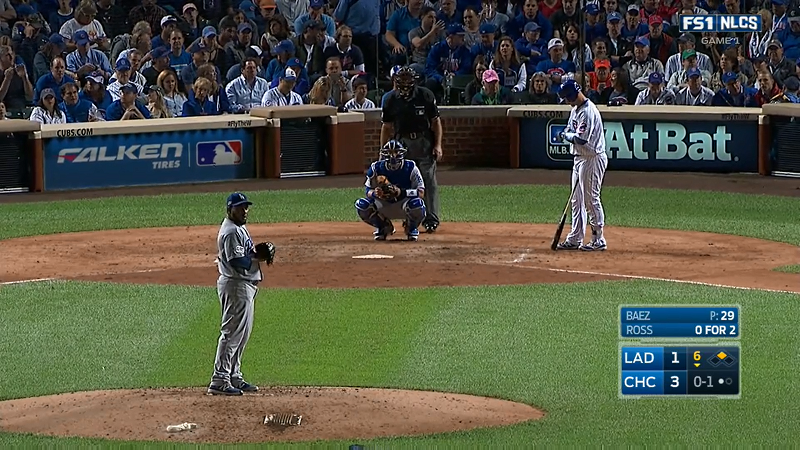 More to the point, he calls time after at least 10 seconds of looking at Baez without Baez ever coming set. It’s Baez who’s slowing things down, and Ross gets tired of waiting, so he asks if he can wait some more. I know it seems like it’s Ross who’s causing the delay, but when you stand there long enough, sometimes you need to just reset your focus. If Ross is going to have to wait, he wants to do it on his own terms. So Ross takes some practice hacks and readjusts some things and steps back in. That’s when Baez decides to attempt the world’s least convincing pick-off move. In fairness, there aren’t many graceful ways to spin around and throw the ball to second base, but look at how early Baez takes the ball out of his glove, here. It’s easy to read — so easy that no one shows even the slightest hint of concern. The runner is walking back, and Ross isn’t even looking at the play. 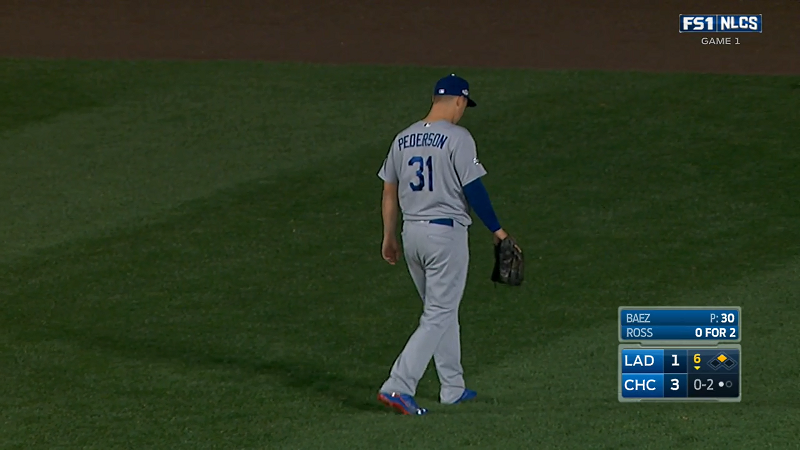 He’s looking for a sign from the first-base coach, and the first-base coach probably has a sign, albeit not one for his own player. 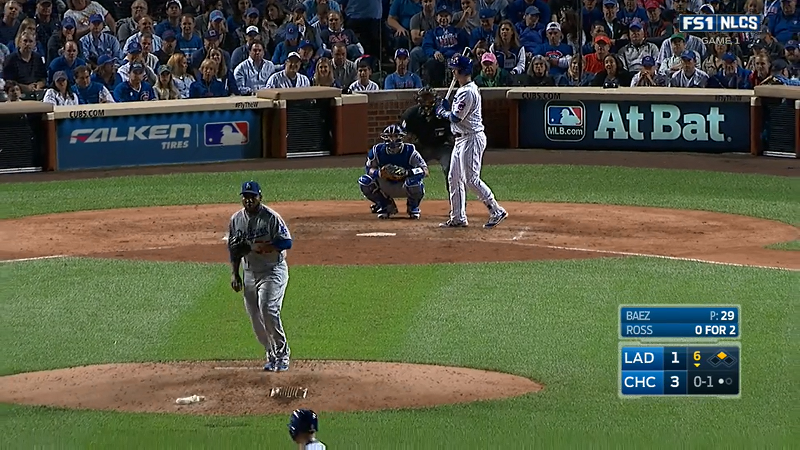 The pick-off glance comes nearly a minute after the at-bat’s first pitch. Do you know what it takes to get annoyed during a playoff game that’s reasonably close? Something has to be sufficiently obnoxious that it breaks through the enveloping tension. 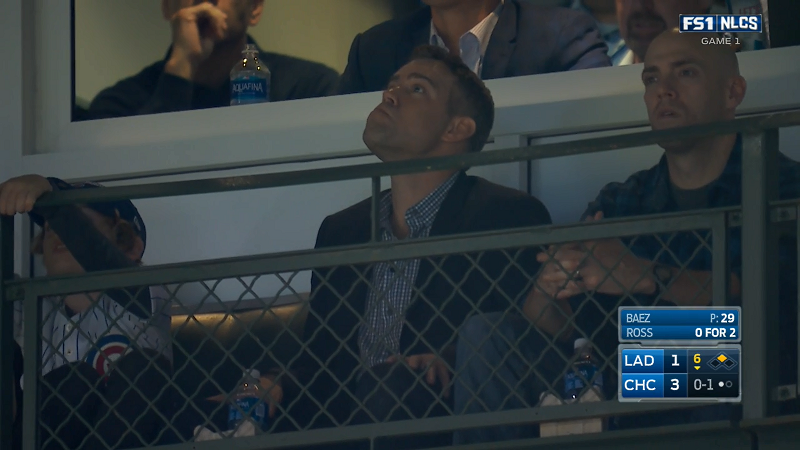 Theo Epstein, for an instant, questions his choice of career. Kenny, would you like to fill some time, here? This Baez is — really tough to watch. The defense is just standing there, flat-footed, while he’s just taking forever. Say what you will about Joe Buck, but there’s no legitimately questioning his professionalism. One would generally consider it unprofessional to openly complain on air about how difficult a certain player is to watch. First game. First game for Buck seeing Baez. Baez scrapes at the dirt. The dirt’s fine. He looks back at second. All the same people are still there. He looks down and shifts his weight from leg to leg. He scrapes a little more, and looks at his catcher. He looks. He continues to look. I’m starting to think the catcher is also in some way complicit. 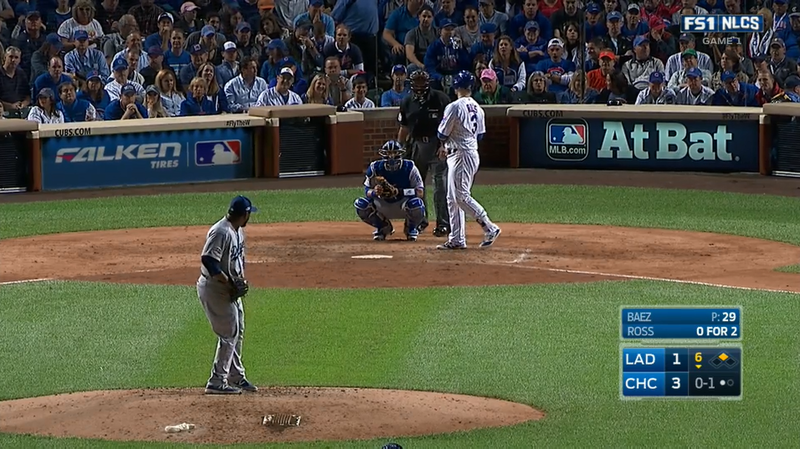 As Baez is looking, Adrian Gonzalez isn’t. Howie Kendrick is looking, but he’s thinking about soup. Baez comes set. He breathes, deeply, and then explodes into action. The pick-off attempts have accomplished nothing, as the runner reads him like a book. But there’s a pitch, and it’s fouled. Which means Baez will have to throw at least another pitch. I can’t imagine why you’d want to watch this whole miserable sequence in its entirety, but here you go, you maniac. But Baez could do himself and the Dodgers — he could find a way next season to quicken it up a little. If Baez has shown anything in his young career, it’s that he’s only working slower. And this year, among all the Dodgers pitchers with at least 30 innings, it was Baez who allowed the lowest BABIP. 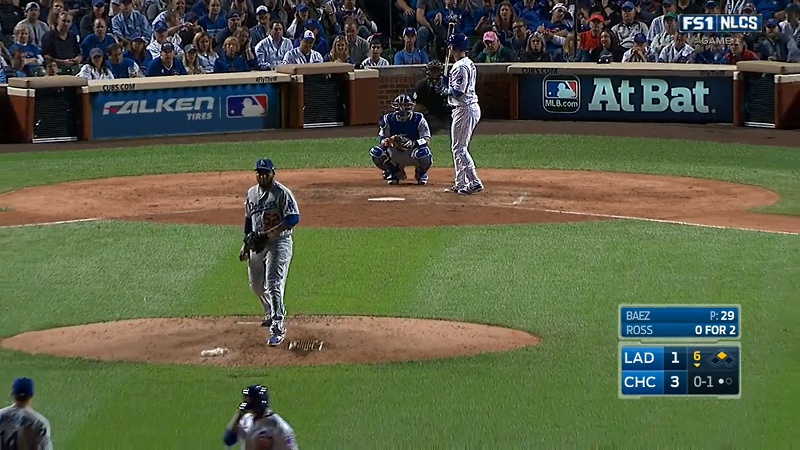 On the one hand, you’d think maybe Baez would lull his own defenders to sleep. But on the other hand, they’d also be incentivized to never miss a single could-be out. We hoped you liked reading Here Are 111 Seconds of Pedro Baez Not Pitching by Jeff Sullivan!